In an era of digital transformation it might seem to the casual observer that networking capabilities wouldn’t be at the top of IT leaders’ lists as something critical to address today. Surely, one might assume, the structural changes that enterprises all over the world are now pursuing are about integrating processes more tightly with their network, and the network itself is already digitally native. Indeed, the first reason that a company might turn to software-defined wide-area networking (SD-WAN) is not to help it become more digital, but to simplify, streamline, and optimise the networking capabilities it already has. In many enterprise WANs today, policy management – the routes between different areas of the network, the prioritisation of some application data over others, rules stopping data from going where it shouldn’t – is performed by operators on a router-by-router basis, often through the command line. Maintaining such a system demands intense planning and oversight as well as laborious processes when network policies need to be changed. SD-WAN completely upends the network management workflow. By providing a centralised, application-aware, and automatable cloud platform for network oversight, policy can be applied across the whole network on an on-demand basis, and that policy can react to changing network needs. For example, a business might add a new software-as-a-service (SaaS) collaboration application, roll it out globally, set compliance-related rules on where the application’s data is allowed to go within the network, and implement traffic shaping for video-conferencing bandwidth peaks, all without having to think about the network’s physical links or methodically apply these rules server by server. While the potential efficiency savings are obvious, to think about SD-WAN only in terms of reducing man-hours or implementation lead time would be to miss some of the more radical changes to business methodology that the technology can deliver. Here are four of the less-considered upshots of SD-WAN I see coming into play over the next year or two. For many years, it has been generally accepted that the simplicity of installation and usage that consumers demand comes at the cost of the power that enterprise users need, and vice versa. 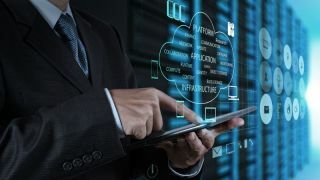 Over the last decade, developers of enterprise applications have faced a serious challenge when trying to utilise the flexibility offered by the cloud, while also building in the level of security and reliability that a business needs, in order to comply with regulations and guarantee service availability to its workforce. By its nature, SD-WAN offers the flexibility of the cloud, allowing applications to be installed and run anywhere, making data available in multiple points of presence, and enabling a rapid development cycle via on-the-fly updates. At the same, it maintains the end-to-end nature of routing protocols such as Multiprotocol Label Switching (MPLS), allowing for a level of demonstrable security not normally possible in cloud environments. As a result, the tools that companies need to operate will begin to feel more and more like a consumer-grade experience, so that employees can get on with the business of the day. Unlike the mere speed-boost that 4G delivered to our devices, 5G promises to involve a fundamental rethink of how mobile networks are constructed and operate. With blankets of small-cell antennae, radically reduced latency, and new modes of everything-to-everything communication, 5G will on-load a mass of new device types and network modalities, threatening to radically complicate the network landscapes which administrators must account for. SD-WAN will ease the burden of that management work through the power of policies which react to changing network needs. As 5G devices proliferate, an SD-WAN control centre will provide the visibility administrators need to stay on top of their networks. However, I believe that, beyond this, companies which quickly adopt both 5G and SD-WAN will find significant synergies between the two technologies. Because SD-WAN is application aware, while also being relatively agnostic as to the type of connections being used, it can be used to rapidly deploy new points of service: remote offices might be provisioned within hours, not weeks, and even on a temporary basis, by treating its 5G connectivity as though it were a traditional physical network link. Today, business users and IT teams too often find themselves at odds. Users want easy access to the applications and data they need to enable them to get high-quality work done quickly. IT, meanwhile, must focus on the nuts and bolts of networks, appliances, storage, and everything other than making access easy, forcing them to respond to user requests by saying ‘no, because…’. The shift change that SD-WAN creates in network administration methods means that IT teams will be able to align their priorities with those of their end-users. Abstracting the nuts and bolts into a software command centre enables faster decision-making and more agile responses to changing demands, and therefore empowers IT teams to say ‘yes’ to their users. The way in which enterprises think about cybersecurity, data breaches, and privacy protection has evolved rapidly in recent years. Partly this is due to high-profile incidents involving failures in major corporations. It is also a result of new regulation, such as the General Data Protection Regulation (GDPR), creating a framework for governmental response to inappropriate data handling. Regardless of an organisation’s context, data and security is now a matter of necessity - not a matter of preference - which if handled badly can pose an existential threat to the organisation. SD-WAN can help prepare organisations for this new operational reality in two key ways. First, a centralised point of control for network activity radically simplifies the management of layers, which sit on top of the base-level network, such as firewalls and identity management. Policies in these areas, as with routing policies, can be disseminated across the network in one move, reducing the risk of oversights and human error. Second, in just the same way that SD-WAN can easily create pathways for application data to travel along, it can just as easily shut those routes down. No network is 100 per cent immune to attacks and breaches, and once a problem is detected, the business needs to be able to respond quickly and efficiently to limit the extent of the damage. By establishing security zones ahead of time, administrators using SD-WAN can rapidly isolate security flaws and thereby minimise the damage – reputational and financial – that those flaws threatened to cause. The adoption of SD-WAN is an opportunity for IT teams to rethink how the essential networking capabilities they provide operate in their businesses, offering unrivalled access to the right resources at the right time whilst simultaneously minimising complexity, inertia, and risk. Indeed, SD-WAN is a sector in rapid growth, and smart systems administrators will no doubt find new ways of leveraging it as it spreads across industry. I look forward to seeing where the network goes next.